ZTE has revealed its new foldable phone with a dual-screen at Duggal Greenhouse. The smartphone company claims it’s creating a new smartphone category. 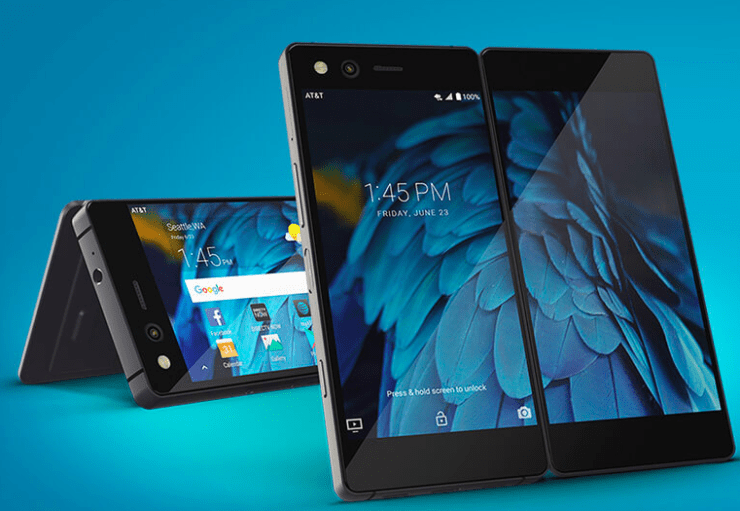 The Axon M will be launching next month exclusively on AT&T Next program. It runs Android 7.1.2 Nougat, although ZTE says it’s looking forward to moving to Oreo in the near future. The firm is offering a free two-year warranty with every Axon M through its Axon Passport M program. With respect to other details, the Axon M sports a Snapdragon 821 chipset, 4 GB RAM, and 64 GB of storage, expandable by up to 256 GB via microSD. It has both of its displays as 1080 LCD panels protected by Gorilla Glass 5, which makes a combined measurement of 6.75-inches diagonally. Let’s start with the Traditional mode, in this mode, the Axon M looks like any other candy bar-style phone. All of the hardware buttons are lined up along one side of the phone, and the power button doubles as a fingerprint sensor, in Sony fashion. With the Extended mode, once you flip out the second display, the entire system UI spans across both screens, giving you a much larger surface area for games, maps, and so on. Certain elements feel a bit clumsy, like how the notification tray covers the top half of both screens, but in the case of apps with large amounts of information like spreadsheets, this could be a useful way to display everything at once. So long as you don’t mind the large bezel divide between the screens, you are good to go. The Dual mode might be a bit more useful if that split is just too much for you to handle. With it, you can run different apps in each screen, whether that’s your calendar and email, YouTube and Slack, or even just two separate tabs in Chrome. This certainly seems like the most practical way to make use of the dual displays, which works in both portrait and landscape view. Finally we have the Mirror mode that lets you display the exact same contents on both screens. ZTE demonstrated this for use in a two-player games, where each player would have their own view rather than huddling around the phone laid flat on a table.